The following notes were produced for a NOSAS field trip to Allt Dubh, Scatwell during the Highland Archaeological Festival, October 2016. In 2006 NOSAS embarked on a project to explore Strathconon and record its archaeology. One of the many highlights was the discovery of over 50 illicit still bothies. Quite clearly the glen was a hot-bed for the illegal activity. Many of the stills are in remote mountainous terrain but within the small wooded glen of Allt Dubh in Strathconon there is a discrete landscape which appears to be devoted almost entirely to the production of illicit whisky. In an area of roughly half a square kilometre there are 4 still sites, 10 small farmsteads, 2 kilns and a further site which as yet remains a mystery! In a wider area of 2 square kilometres a further 8 still bothies have been identified. Most of the sites are not impressive in themselves, they were never substantial in the first place and after 200 years they are in a pretty wasted state and, in the summertime, they are covered by bracken or heather. 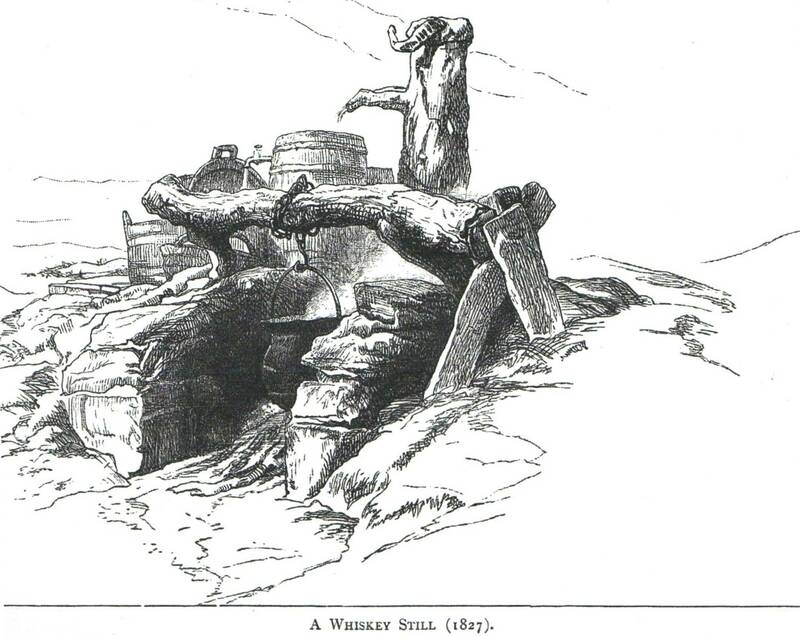 Historical Background – There was a tradition in the Highlands of household distillation of whisky on a small scale for family and local consumption, but in 1780 the government made small stills illegal in the Highlands and increased the tax on the malt used. The quality of whisky became inferior but yet it was more costly. The production of whisky went underground and illicit distillation flourished from 1780 to 1823. Highland whisky was in great demand and satisfying this demand provided an important source of revenue for a burgeoning population. 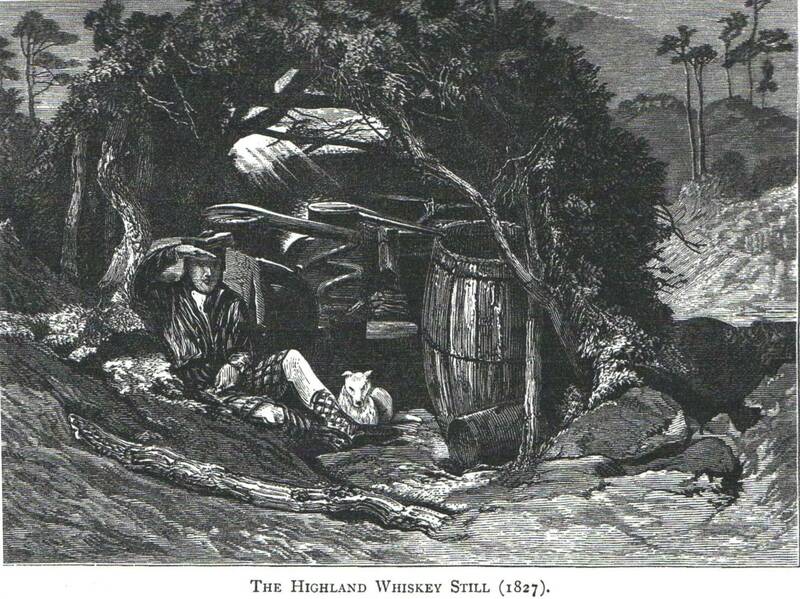 In 1782 over 1000 illicit stills were seized in the Highland zone – a figure that represented only a fraction of the total number in operation. The area at Scatwell gives us an impression of the illegal activities of a certain section of a population in the glen which at that time was very numerous. This entry was posted in General Archaeology, Post Medieval, Strathconon and Ross-shire, Surveying and Recording and tagged Allt Dubh, archaeology highlands, Culrain riots, excise men, grain drying kiln, Hugh Munro, illicit still, Meryl Marshall, New Statistical Account for the Parish of Contin in 1837, North of Scotland Archaeological Society, NOSAS, Post Medieval archaeology, recording and surveying, Scatwell, Sir Edwin Landseer, Sir George Mackenzie of Coul, still bothy, Strathconon, whisky distilling on October 11, 2016 by nosas.